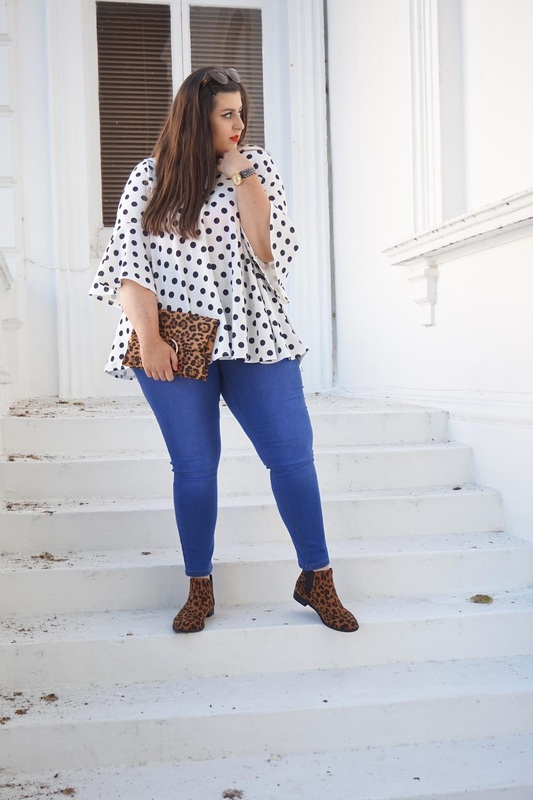 The curvy girl's guide to mixing your prints | Being bold with Simply Be. 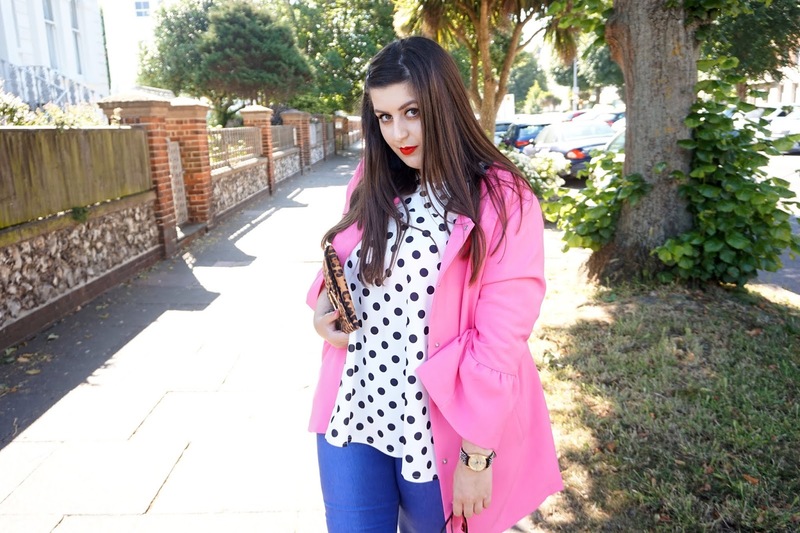 If somebody said to you that you'd have to wear an outfit that comprised of leopard print, polka dots and a bright pink jacket you might have been a little dubious. 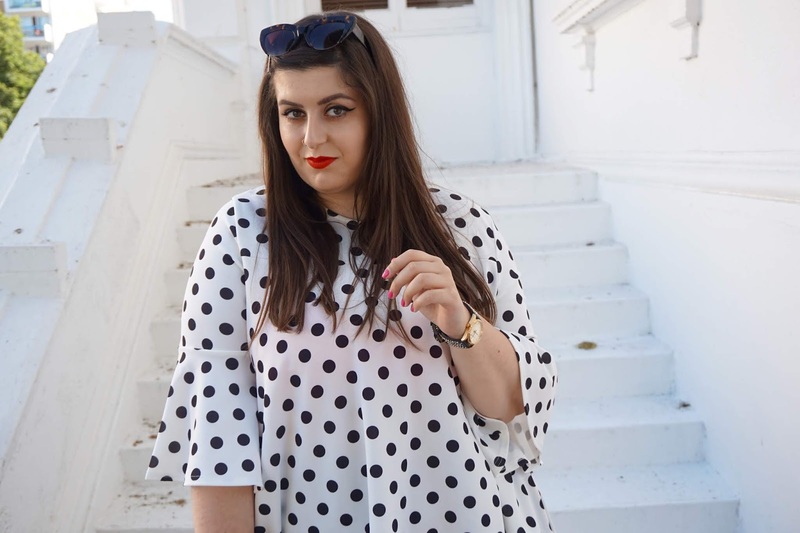 These prints and colours aren't necessarily what you'd think of teaming together when putting a super on-trend outfit together, but hear me out. 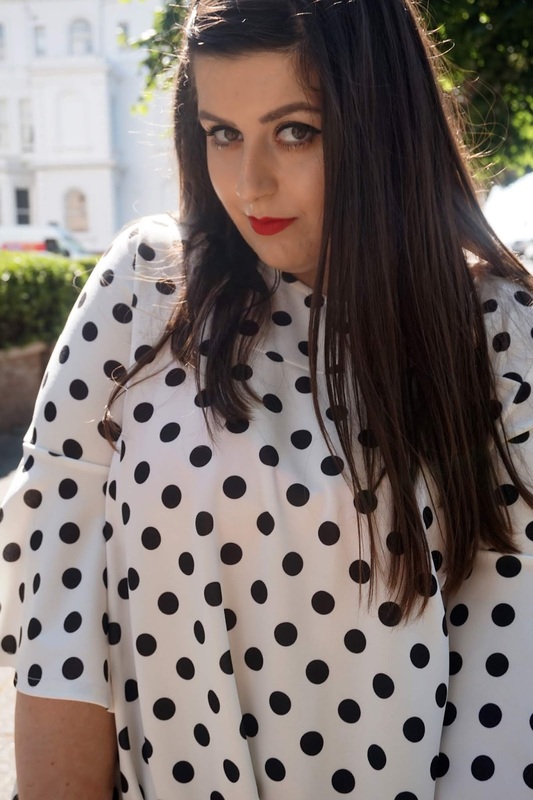 Polka dots (especially monochrome, and even more so the combo of black spots on white) have been super popular from spring through to summer; and leopard print is set to be HUGE for the autumn. 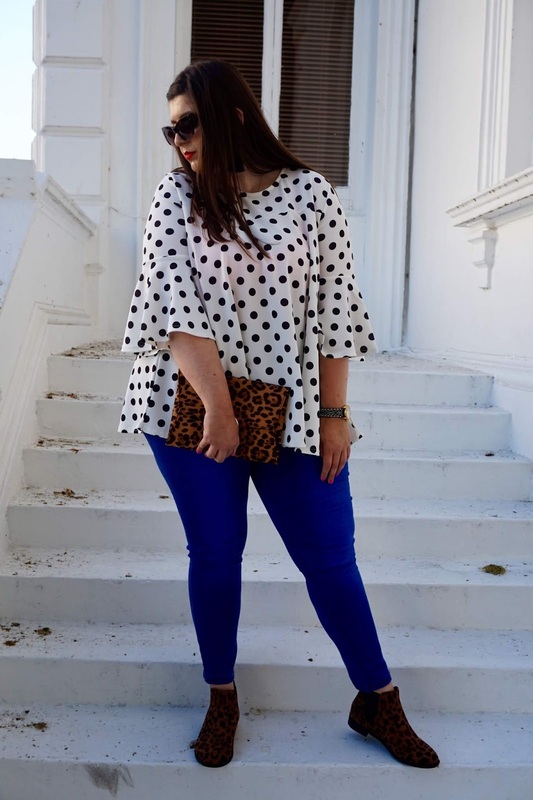 So when you combine TWO super on-trend prints that you might not have dreamed of teaming together, you get the most transitional outfit imaginable. Yep, you've got THE must-have outfit that will see you through this entire year. From summer through to autumn and back to spring again – this outfit can be worn as a complete ensemble or completely divided up so that certain aspects can be added to other on-trend ensembles. This outfit I'm wearing is SO chic, it fits SO well and it's SO comfy too. 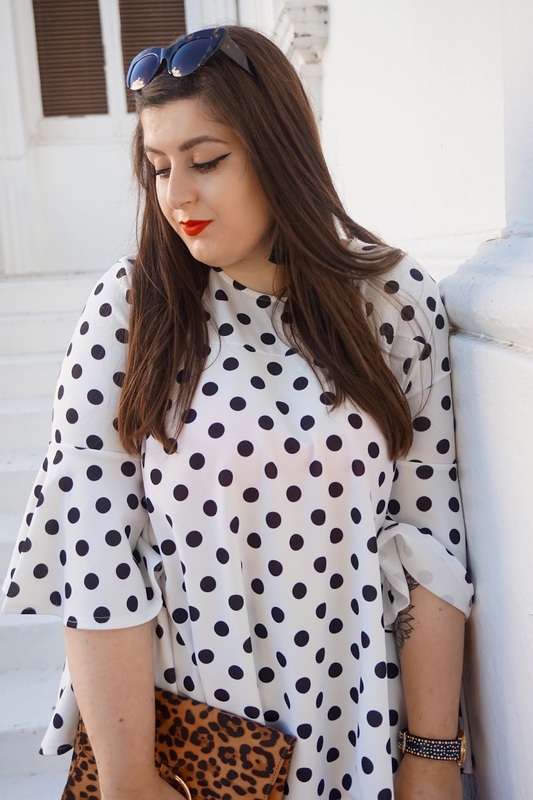 Being a curvy girl means that you sometimes might have to compromise on one thing in order to get the other – but just because we're a little softer, why should that mean we need to compromise on looking hot!? It shouldn't! I won't lie I was always a little dubious about ordering from Simply Be, but I honestly wish I took the plunge long before now. Their clothes are the comfiest clothes that fit like a glove and look BANG ON TREND! With Simply Be I feel like I'm not compromising on a single thing.. I feel confident, gorgeous, comfy and chic. 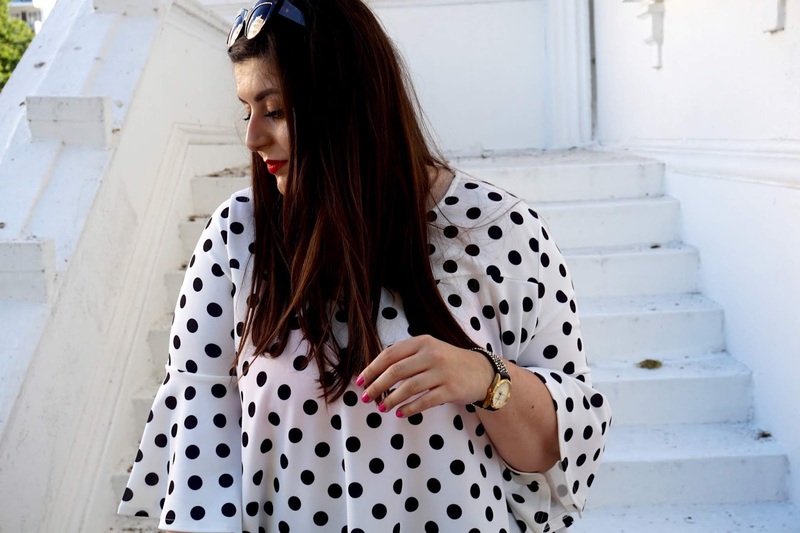 Just because us curvy girls have a little extra softness, doesn't mean we should have to compromise on style. Whatever you buy, wear and flaunt about in should be comfortable, while fitting like a dream and ensuring you feel confident, beautiful and ready to face the world. My advice to any curvy girl, or any girl in fact, would be: wear whatever the hell you want, no matter your shape or size. I truly believe that everybody is beautiful in their own unique way. There's beauty in slenderness, beauty in chub, beauty in curves and beauty in everything. The fact that we're all walking this earth is truly beautiful, and I think there's more important things to worry about than not wanting to wear something because you have fat rolls, cellulite or broad hips. 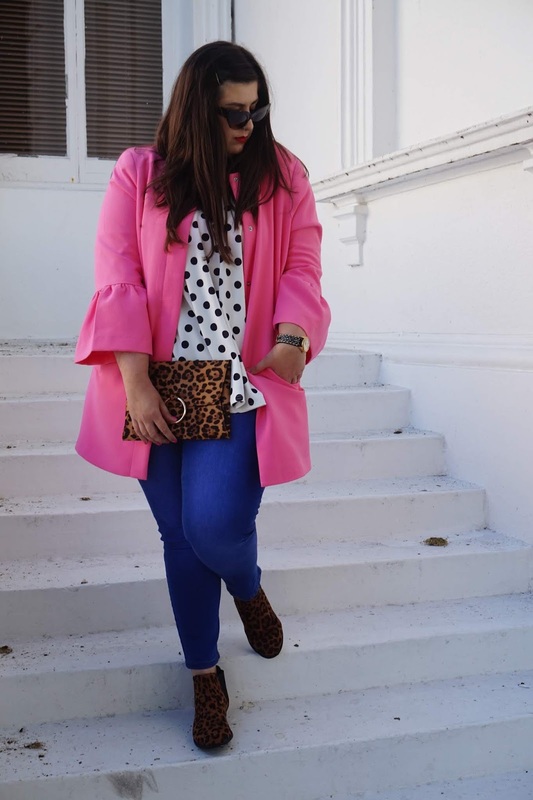 This outfit comprises of the most flattering pair of jeans to have ever graced my booty, a super flattering polka dot print top, the most amazing bubblegum pink jacket, leopard print chelsea boots and a matching clutch that doubles up as a shoulder bag. 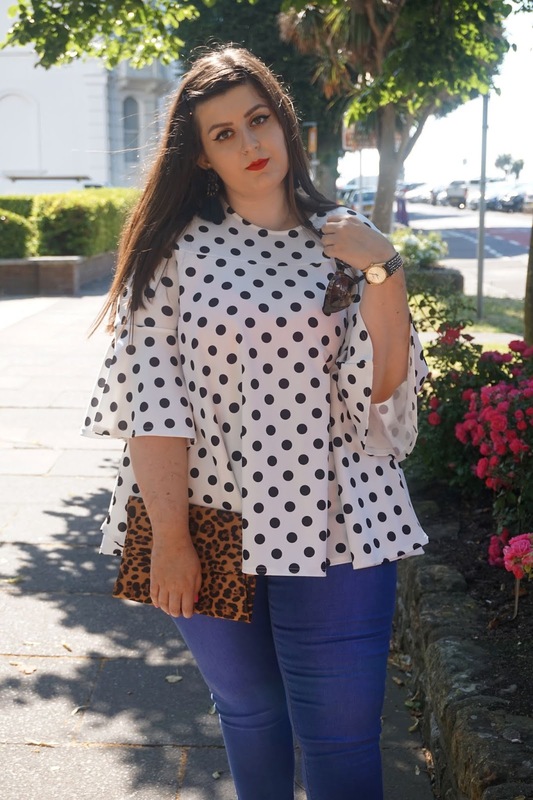 If you're looking for five items to liven up your wardrobe, these five items will do it – super on trend, incredibly versatile and super comfy too. This outfit is a dream! 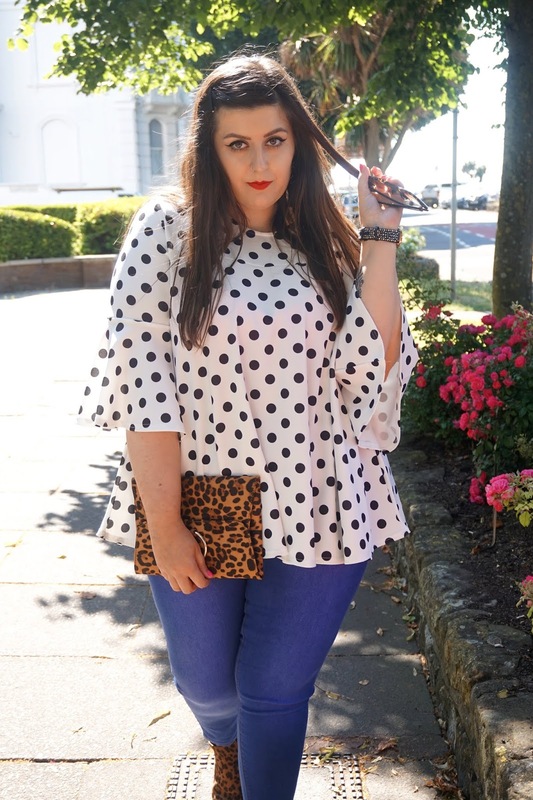 The top I'm wearing is the Polka Dot top by AX Paris Curve via Simply Be. It's really flowy and falls beautifully over your curves while accentuating them. Cool in warm weather and warm in cool weather, this beautiful top is made from a neoprene-like material, which I adore. I'd say this top is true to size, but if you don't want it too, too flow, maybe size down. This gorgeous top retails at £32 but is currently on sale for £25.50. Sizing ranges from size 12 to 32. The jeans are from Simply Be's Shape & Sculpt range, and I have the Bright Blue Skinny Jeans in the Regular length. They fit beautifully and hold in your tummy, while not feeling as though you're about to burst out of your jeans. Sizes range from 10 to 32. I highly recommend these jeans as they fit like a glove, smooth your lumps and bumps out, while keeping your tummy controlled, ALL while being SUPER SUPER comfy! They retail at £42 but are currently on sale for £28.50. 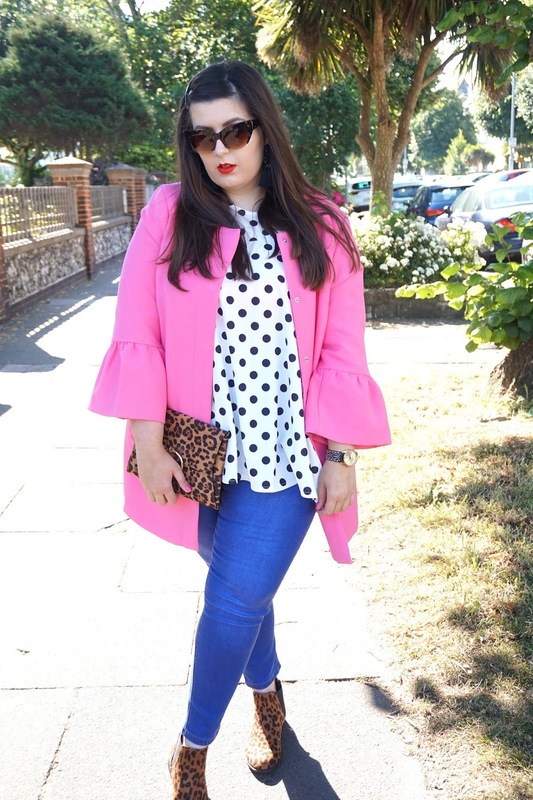 The gorgeous coat I'm sporting is the Junarose Frill Sleeve Jacket in a beautiful bubblegum pink hue. The trumpet style sleeves add a glamorous vibe that dresses up any outfit with complete and utter ease. True to size, with an amazing fit, this gorgeous jacket has the following size ranges: XS=12/14, S=14/16, M=18/20, L=20/22, XL=24/26, and XXL=26/28. With an RRP of £95, this gorgeous jacket is currently on sale for £68.50. The beautiful leopard print accessories I added are the Bella Chelsea Boots and the Sophie Leopard Ring Detail Clutch Bag – each of these stunning accessories team so beautifully with everything else, and I am so blown away by the finished result. The Bella Chelsea Boots retail at £25, and the Sophie Leopard Ring Detail Clutch Bag retails at £15, but is currently in the sale for just £7! I hope that this post has inspired you to mix up your prints a little, regardless of your shape or size. Being confident is key, especially if you want a lit from within glow that money can't buy. Providing your exterior looks amazing, you feel content and you feel as though you can take on the world... that's all that really matters at the end of the day. The entire outfit I'm wearing from Simply Be is probably my most favourite that I've worn in 2018 so far... it's so bold, on-trend and so so me! If you're looking for comfort, class, style and clothes that fit and hug your curves like a dream.. this outfit and Simply Be in general is the answer you've been looking for. Remember to keep shining, sparkling and being true to yourself. If you want any styling tips or advice, drop me a line at molliequirk@gmail.com – I'd seriously love to help! You mixed these prints so well without making the overall outfit too overwhelming and I love these tips! Great top and that jacket is perfect!!! and gorgeous outfits they are too!